There's nothing like a scrumptious whole roasted chicken for a Sunday family dinner. If you are hungry and would like to speed up the cooking process yet still have a tender and juicy bird, the Nu Wave Oven might be your solution. 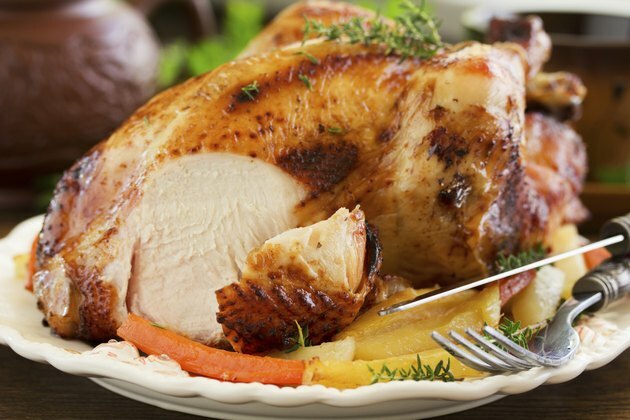 With the Nu Wave Oven's infrared technology you can cook a 3- to 4-pound whole chicken in under an hour. The Nu Wave sits on your countertop, which frees your oven up for delectable side dishes. Place a whole 3- to 4-pound chicken on the cooking rack of the Nu Wave Oven, breast side facing down. Cut an onion into quarters and place it in the cavity of the chicken. Squeeze the juice of half of a lemon into the cavity of the chicken. Add from two to four garlic cloves into the cavity along with the lemon juice and onion. Rub 3 tablespoons of olive oil over the entire skin of the chicken. Sprinkle 1 teaspoon of paprika, a few sprigs of fresh thyme and ½ teaspoon each of salt and black pepper on the chicken. You can substitute other spices or adjust the measurements according to your taste. Place the top dome onto the Nu Wave Oven and set the timer for the appropriate cooking time; allow 15 to 17 minutes for each pound. Pause the Nu Wave Oven half way through the cooking process and open the dome to turn the chicken over. Resume cooking. The internal temperature should be at 170 to 180 degrees Fahrenheit. Allow the chicken to sit for 10 minutes after cooking and then serve it.